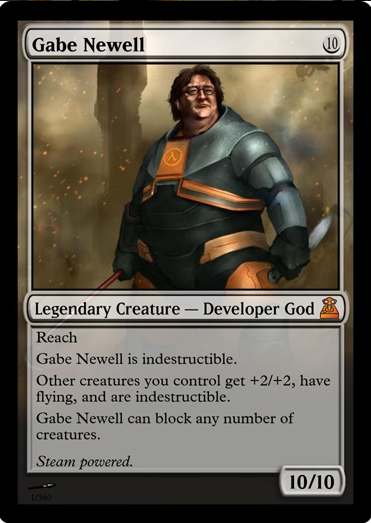 "Gabe Newell is indestructible." Yes. Yes he is. 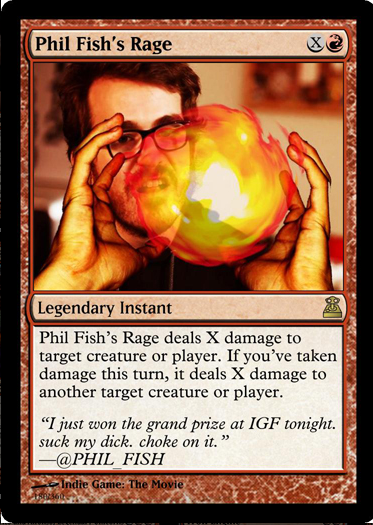 Thanks to the twisted minds of Andy Hull, George Fan, Edmund McMillen, Kyle Pulver, Tommy Refenes, Laura Shigihara and Derek Yu, fans of Magic The Gathering now have something new to obsess over: the Indie Custom Cube. 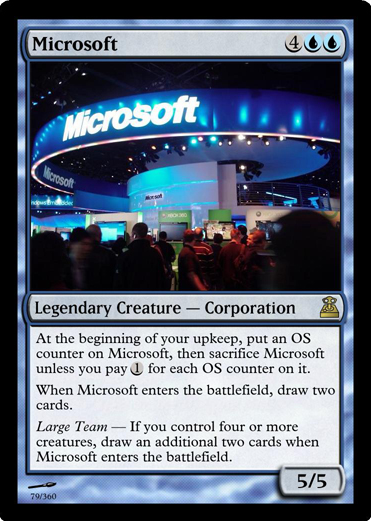 Fancy drafting Gabe Newell and Microsoft in the same deck? Sure, it's doable, but don't be surprised if you hear screams of agony emanating from somewhere in Washington state. Good thing Newell's indestructible. 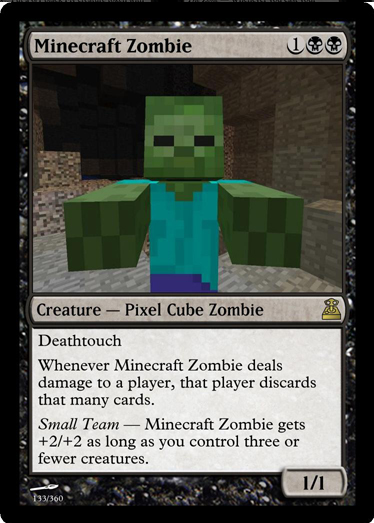 The cards you see here are just a small sampling of the 360 unique cards available in the Cube. 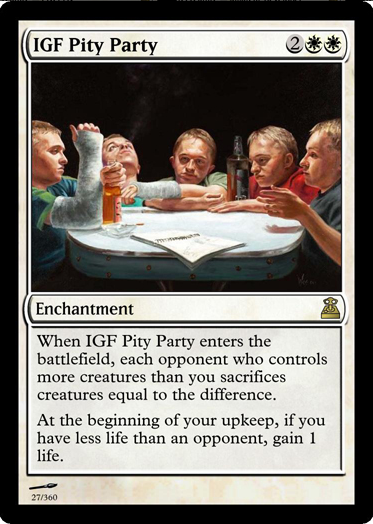 The idea came from many happy evenings playing MtG. 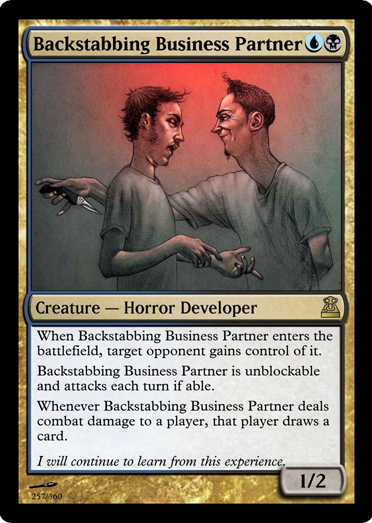 The devs joked about how fun it would be to create cards based on their corner of the industry, and after a while the idea took root. Before long there was a Google document to keep track of what everyone was doing and, as everyone knows, once a Google doc has been created, madness follows. The team took care not to create multiples of, say, Jon Blow or Super Meat Boy; the idea was to have fun, not to kill the concept with a multitude of cloned characters. This thing was playtested at GDC 2013, and it's been tweaked a time or two since then. "Hopefully, you'll enjoy the cube as much as we do!" says the team. Fancy a shot? 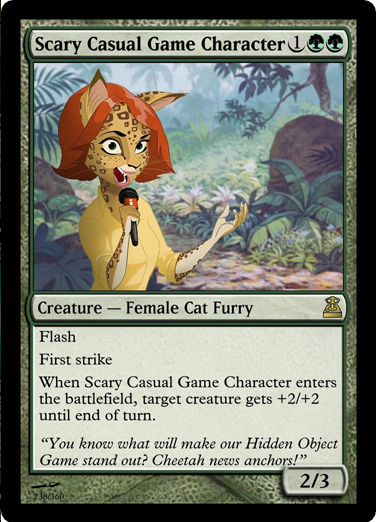 There's a whole mess of cards just over here.